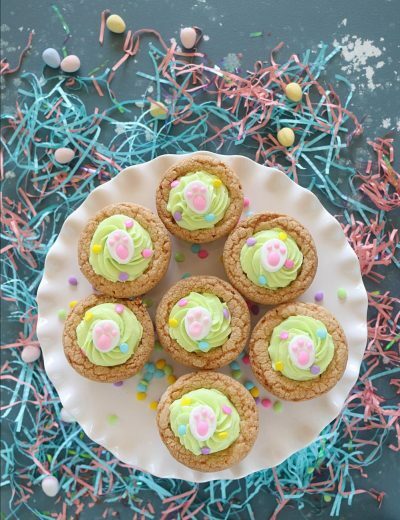 Enhance your morning meal with these flavor-packed breakfast pinwheels. These tofu scramble pinwheels are prepared with fresh and wholesome ingredients that will keep you full and satisfied till lunch. Honestly, breakfast can’t get better than this! I am a huge fan of morning breakfast and always on the lookout for new and creative ways to enjoy it. Among all types of breakfasts whether its veggie quiche or pancakes, grab-n-go ones are my all time favorites. So easy to hold and can be enjoyed while heading out the door. Today’s recipe, Tofu scramble breakfast pinwheels, perfectly fit the definition of grab & go. 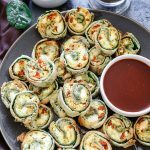 In addition to that, these nutrient-rich pinwheels have no cheese and is a perfect delight for weight watchers too! This make-ahead breakfast requires a simple sequence of layer, roll, chill, slice, and bake. You can do the first two steps a night in advance and chill the bread logs overnight in the fridge. Next morning all you have to do is slice and bake. Pretty simple, right! Trust me; soon it will become an obvious choice for breakfast! What makes up these Breakfast Pinwheels? Bread – only soft textured loaves of bread will work with this recipe. Artisan bread or bakery bread will not work. Homemade Green chutney- I have used cilantro to make a green dip for my pinwheels but feel free to use parsley or mint as a substitute. A word of advice: do not add water to the chutney. For this recipe, we need a thick paste-like chutney. A runny chutney will make the bread soggy and difficult to work with. Spinach leaves – have used spinach because it’s a nutrition-rich vegetable. It’s loaded with carotenoids, vitamin C, K, folic acid, iron, and calcium. Therefore, its a great addition to these pinwheels. Tofu scramble- The addition of protein-rich tofu make these pinwheels healthier and wholesome. I have used extra firm silken tofu as it provides a creamy and silky texture to the crumble. 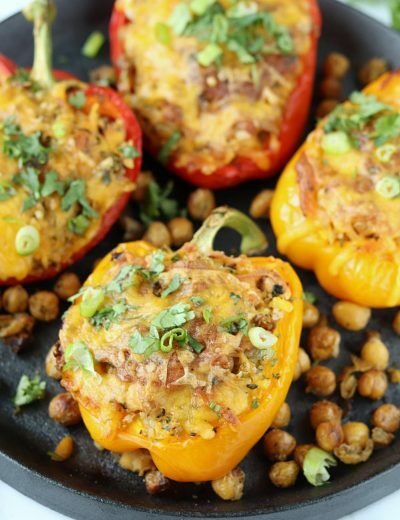 For added flavor and extra crunch, toss in some red bell pepper and onions. Altogether, it adds a nice healthy twist to a standard breakfast recipe. How to make Tofu Scramble Breakfast Pinwheels? This pinwheel is a relatively straightforward recipe that comes together with a handful of ingredients. I love the combination of tofu with red bell peppers and spinach. 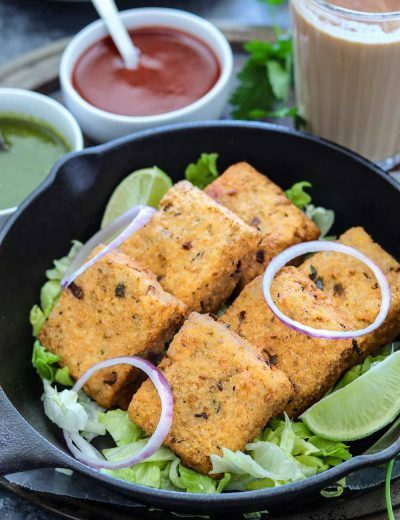 The slightly nutty and natural flavor of tofu blends perfectly with other ingredients, and you get to taste various relishes in every bite. Start the recipe by preparing tofu scramble and season it with a mixture of chili flakes, cumin powder, and salt. Trim the crusts off of the bread slices and flatten each slice with a rolling pin. Roll each slice gently with the rolling pin, do not make the slices to thin. Take a slice and lay it flat on the plate. Apply a layer of green chutney on top. Layer it fresh spinach leaves. Cover it with another layer of bread. 5. Top this layer of bread with two tablespoons of tofu scramble. Spread it evenly across the bread slice. Apply another layer of bread and gently press the whole stack. 6. Transfer this stock on a foil and gently roll the bread into a log. Wrap this log with a foil. Repeat the process with rest of the bread and this recipe will make 6 logs. 7. Chill the logs in the refrigerator for 25 minutes. 8. After the desired resting time, unwrap the logs and cut them into thick rounds. Spread them in a single layer in the airfryer. Lightly spray oil all over your pinwheels. Bake in the airfryer @ 350 degrees F for 8 minutes turning them halfway until crisp and brown. Remove from oven and serve hot with tomato ketchup or dip of your choice. Variations of Tofu Scramble Breakfast Pinwheels! Don’t have a liking for tofu, sub it with paneer (Indian Cottage Cheese). Like it cheesy, add shredded cheese to the top layer of your pinwheels. Swap fresh spinach leaves with thinly sliced cucumber or zucchini slices. Instead of shaping them like a pinwheel, you can make it into squares too. Arrange it the way its shown in the recipe. Now instead of folding it into a log, cut the whole stack into four cubes and bake. 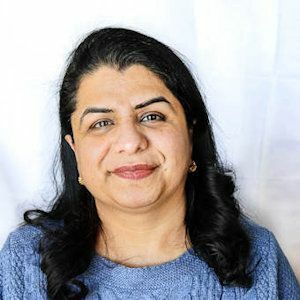 Neither a tofu or paneer lover, try mashed potatoes, seasoned with mild spices. For flaky pinwheels, substitute bread for puff pastry sheets or store-bought crescent roll dough. Butter makes everything tastes good, so if you are not watching your calorie counts then drizzle some butter on top of the pinwheels instead of oil. What can you serve Tofu Scramble Breakfast Pinwheels with? These vegetarian pinwheels taste best when paired with tomato ketchup or coriander chutney. But, feel free to serve these with sriracha mayo or even garlic ranch. Yummmm! 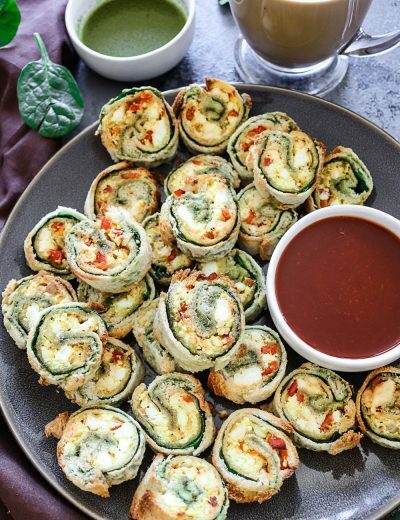 Enhance your morning meal with these flavor-packed breakfast pinwheels. These tofu scramble pinwheels are prepared with fresh and wholesome ingredients that will keep you full and satisfied till lunch. Crumble the pressed tofu into a medium bowl. TIP - to press tofu - wrap the tofu block in between a layer of paper towels. Apply steady weight to the tofu and squeeze out all the moisture from the block. Make sure there is no moisture in the tofu. Heat oil in a pan. Add onions and bell peppers to it. Saute on a medium-low flame for 2-3 minutes. Add crumbled tofu along with red chili flakes, salt, and cumin powder. Mix to combine. Allow it to cool. Meanwhile, prepare the green chutney. Transfer all the ingredients listed under 'chutney' to a blender. Blend until smooth. Please do not add water to the chutney. It should have a thick consistency. Set it aside. Take a slice and lay it flat on the plate. Apply a layer of green chutney, followed by spinach leaves. Apply another layer of bread and gently press the whole stack. Transfer this stock on a foil and gently roll the bread into a log. Wrap this log with a foil. Repeat the process with rest of the bread and this recipe will make 6 logs. Chill the logs in the refrigerator for 25 minutes. After the desired resting time, unwrap the logs and spread them in a single layer in the airfryer. Lightly spray oil all over your pinwheels. Remove from oven and serve hot with tomato ketchup or dip of your choice. Can I make Tofu Scramble Breakfast Pinwheels in an oven or cooktop? Absolutely. Arrange these pinwheels on a greased baking tray and bake @350 degrees F for 7-8 minutes (turning them halfway) until crisp and slightly brown. On Cooktop - arrange the pinwheels on a greased griddle in a single layer. Apply oil and cook on both sides until crisp and evenly brown. Can these Tofu Scramble Breakfast Pinwheels be made in advance? Prep your logs the night before and chill them overnight. When ready to serve, unwrap the bread logs, slice, and bake as directed. Serve on a platter and enjoy. Looking forward to impress a large gathering on the breakfast table? then these pinwheels will come in handy. Make a big batch and chill. Slice and bake. If you plan to chill the bread logs overnight then the sequence will change slightly. Layer the bread first with spinach leaves followed by chutney then bread slice and so on. This will prevent the bottom layer from getting soggy. Make sure the chutney you prepared is thick. Too much liquid in chutney will mess up the bread logs. Roll the log with the help of a foil. Use fresh bread as it is soft, tender, and easy to shape. Stale bread will be difficult to roll and may fall apart. Do not add too much tofu scramble layer. Do not bake the pinwheels for longs as they will dry out. Dear Ruchi, can these pinwheels be baked in a “convection Microwave”? Absolutely! Bake at same temperature at the bottom rack.